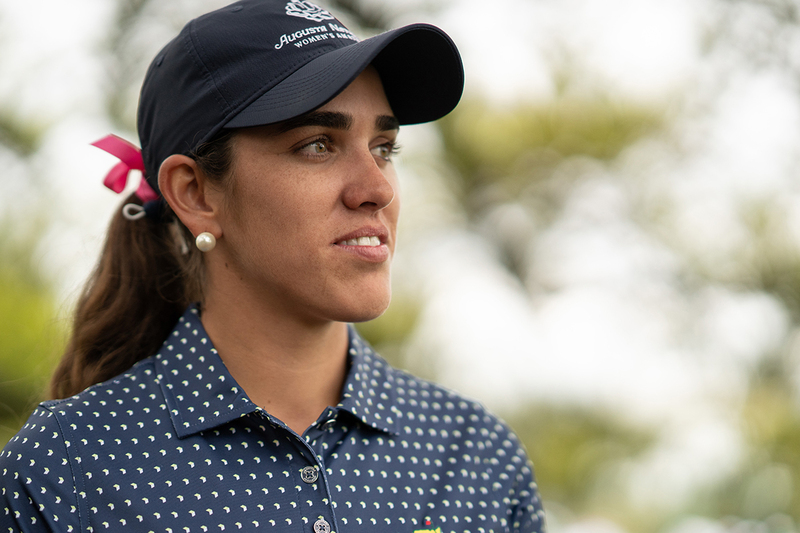 Jennifer Kupcho walks across the Sarazen Bridge on the way to the 15th green during the final round of the inaugural Augusta National Women’s Amateur. 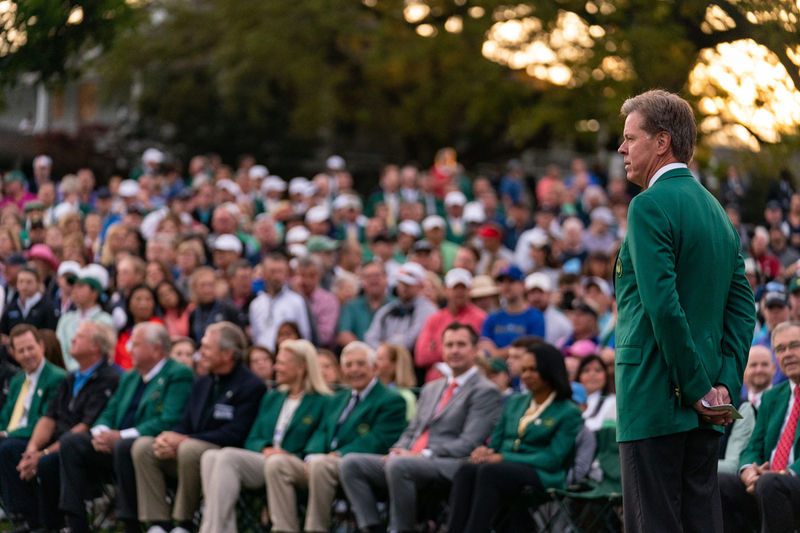 Augusta National Chairman Fred Ridley welcomes the patrons for the ceremonious First Tee shot prior to the final round of the Augusta National Women’s Amateur. 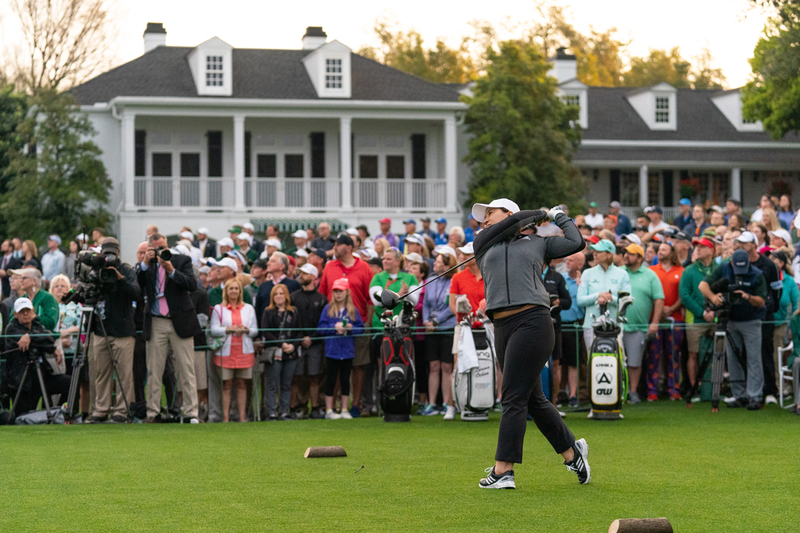 LPGA legend Se Ri Pak with the drive as part of the First Tee ceremony prior to the start of the final round. 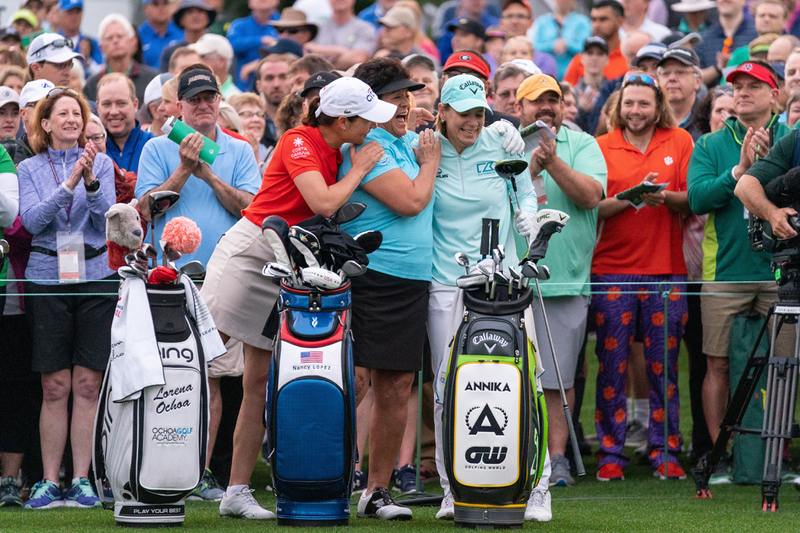 LPGA legends Lorena Ochoa, Nancy Lopez, and Annika Sorenstam share a laugh while taking part in the First Tee ceremony. 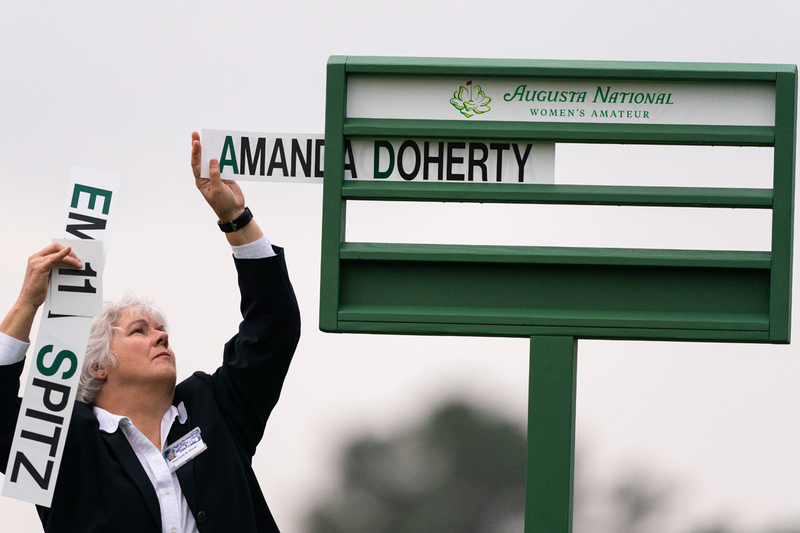 Names are added to the board on the first tee. 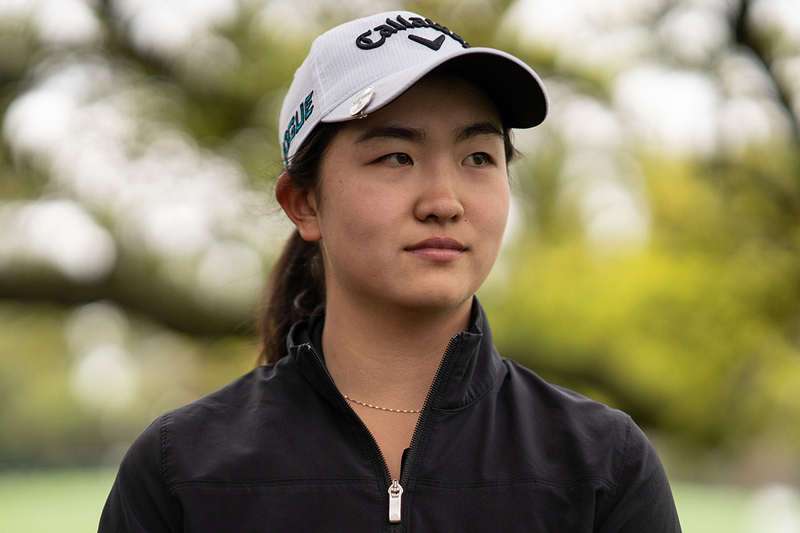 Here’s what some of the women competing in the Women’s Amateur had to say about playing at Augusta and how the tournament has the potential to boost interest and support for women’s golf. 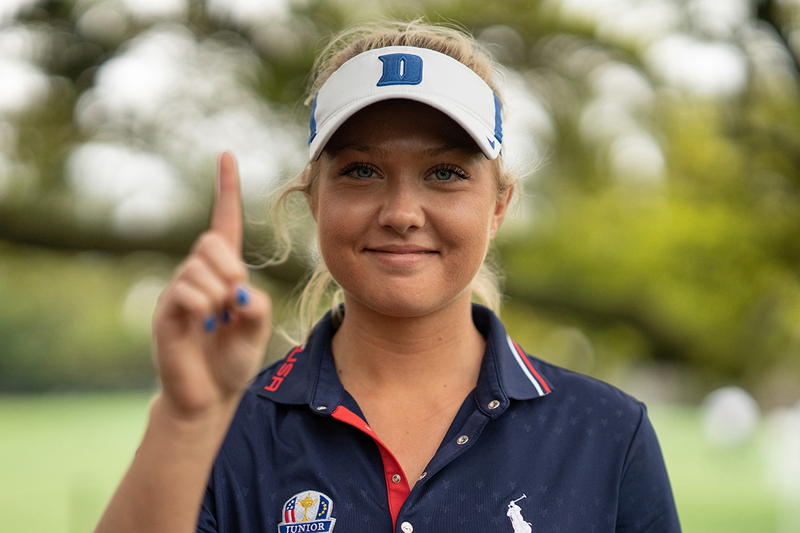 Age: 21 | Hometown: Westminster, Colorado | School: Wake Forest University | Champion of the Augusta National Women’s Amateur, finishing at -10 under par for the tournament and playing the final six holes in five under par, including an eagle on the par-five 13th. “We’ve never really been given the opportunity to play at Augusta, so I think it’s huge to have a tournament here. I think it will help encourage girls to come out and play the game. 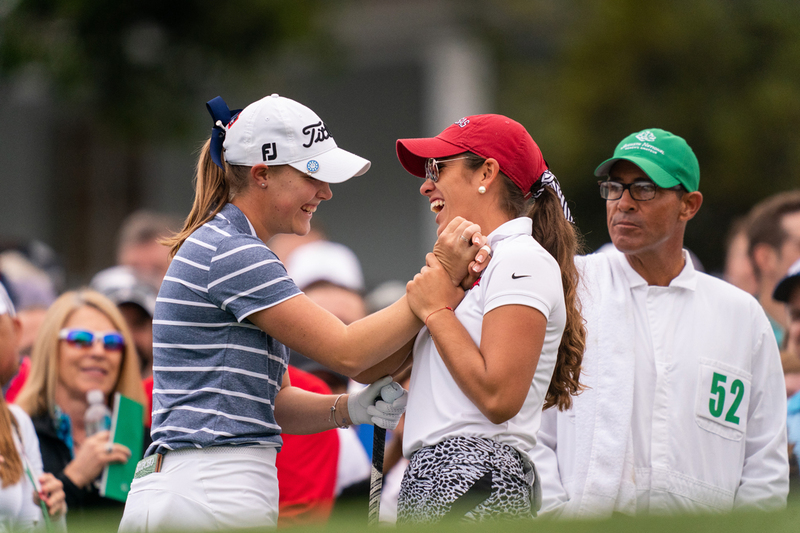 Jennifer Kupcho and Maria Fassi share a laugh on the first tee prior to starting the final round. 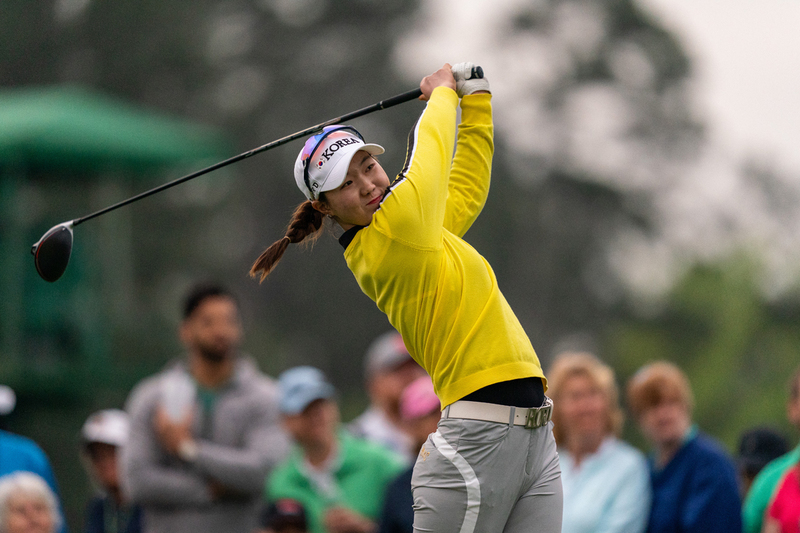 Seventeen-year-old Set-yun-Kwon, from South Korea, tees off the first hole. 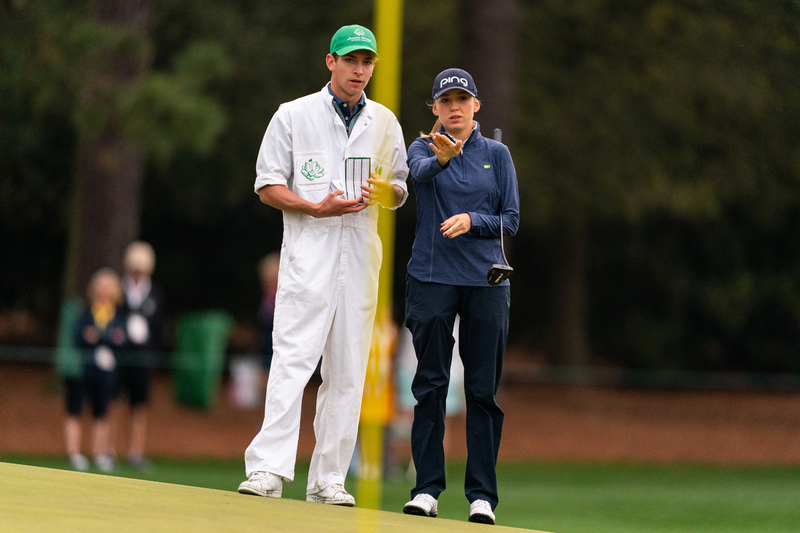 Eighteen-year-old Emma Spitz, of Austria, discusses a putt on hole number one with her caddie during the final round. 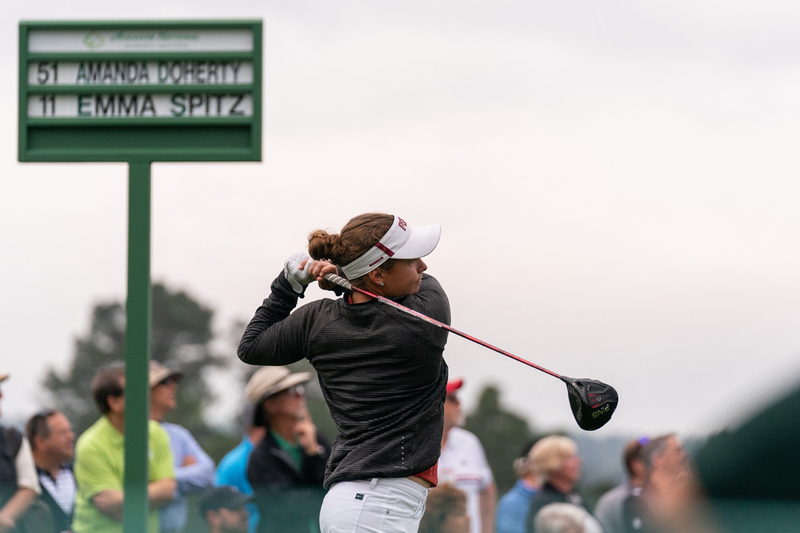 Amanda Doherty, an Atlanta native and sophomore at Florida State, tees off the first hole. 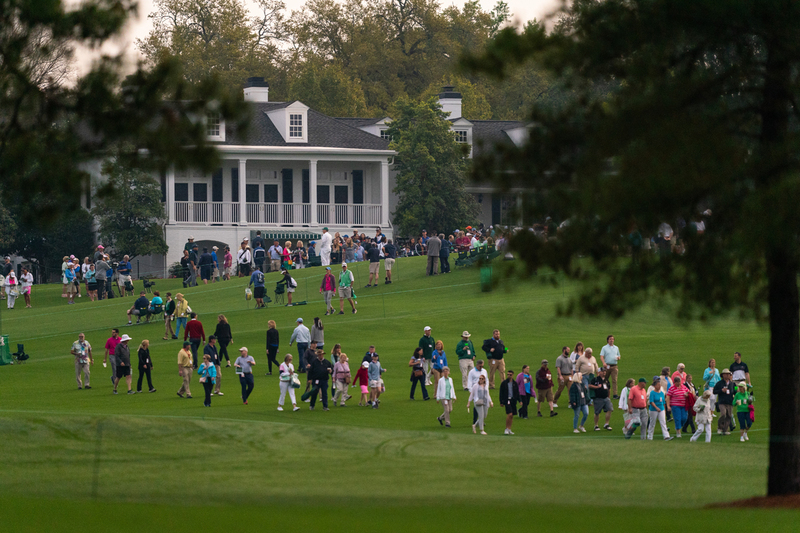 Patrons make their way to various holes on the course. Maria Fassi lines up a putt on the second hole. 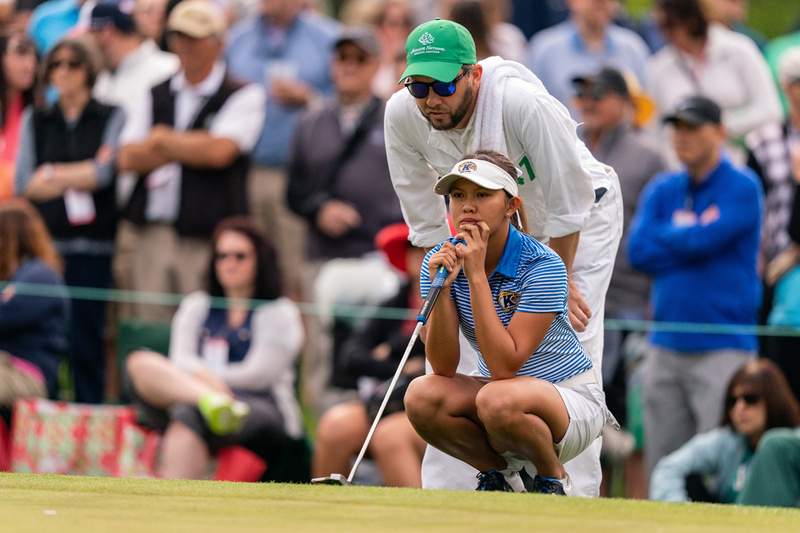 Pimnipa Panthong, of Thailand, a sophomore at Kent State University, discusses a putt on the second green with her caddie. Sierra Brooks, a sophomore at the University of Florida, putts for par on the second hole. Kupcho hits out of the bunker on the second hole. 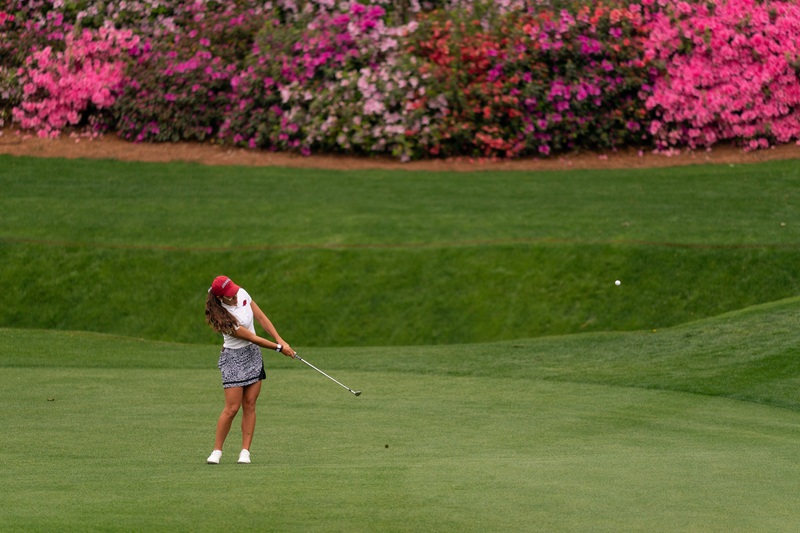 “It’s kind of surreal to be out here and see all the ropes up for the Masters. It’s unreal. TV does not do it justice. You can’t see all the slopes on TV; you can’t see how hilly it is. Fassi tees off the third hole. Haylee Harford, a senior at Furman University, celebrates with her caddie after a birdie putt on the seventh hole. 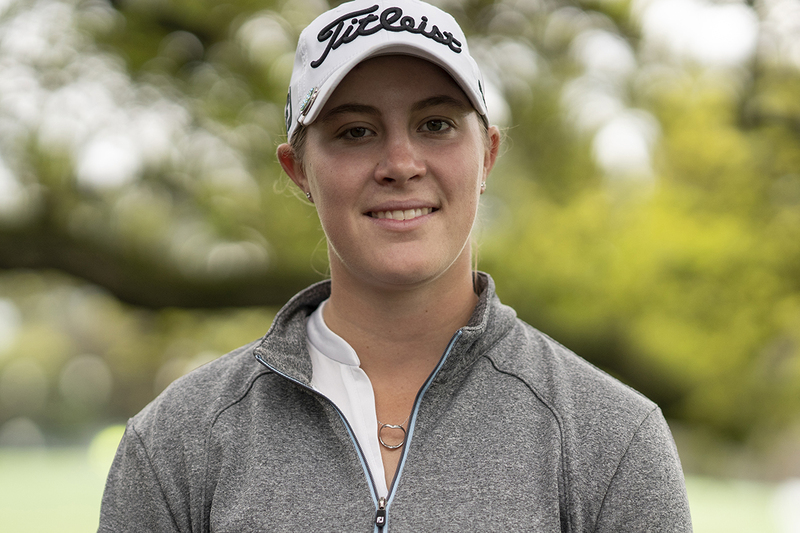 Eighteen-year-old Caterina Don hits a putt from just off the green of the seventh hole. 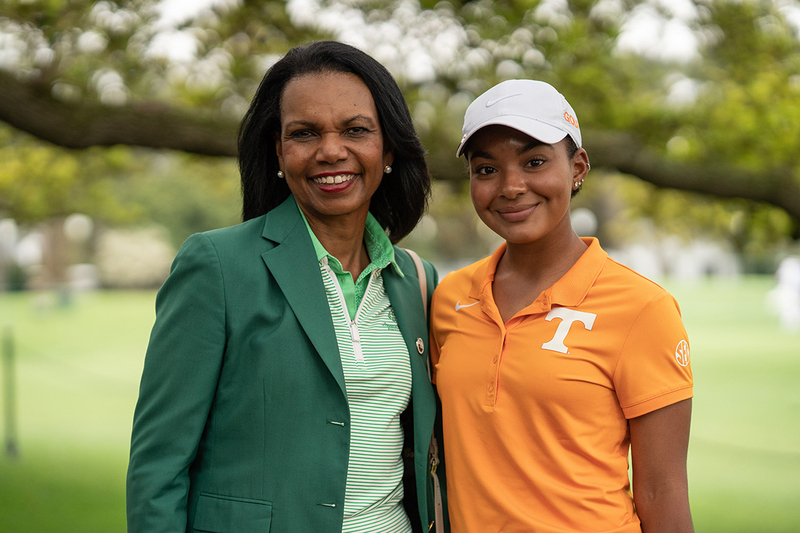 Mariah Smith poses for a photo with Augusta National member Condoleezza Rice. 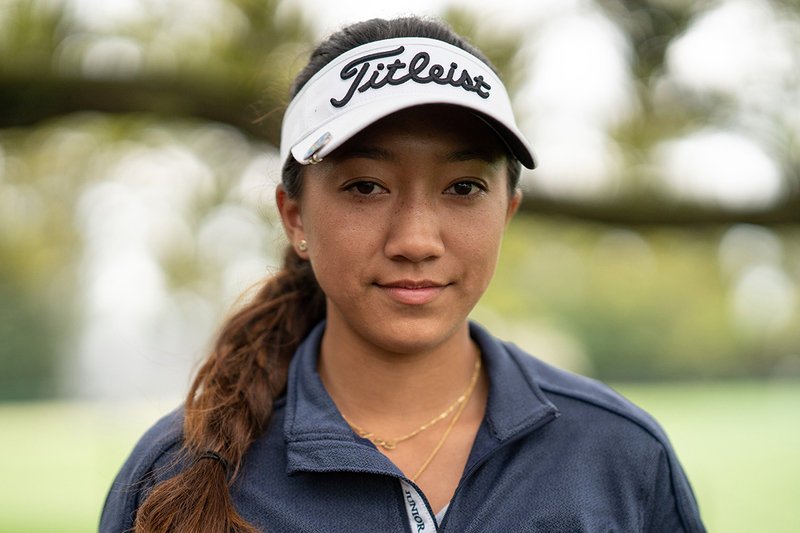 “It was definitely a dream come true; I’ve watched the Masters every year and have always wanted to play this course. For us to finally have a tournament here and to have the opportunity to play on this course really means a lot. It was surreal to walk those fairways and greens. 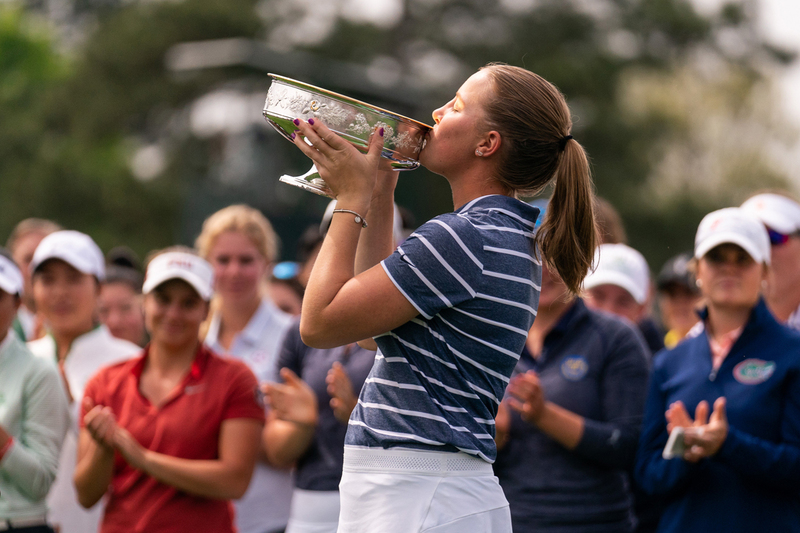 I think this event is very significant for women’s golf, it’s really opening doors for women’s golf and for future generations, I think this is really good for us and is going to help grow the game in the upcoming years. 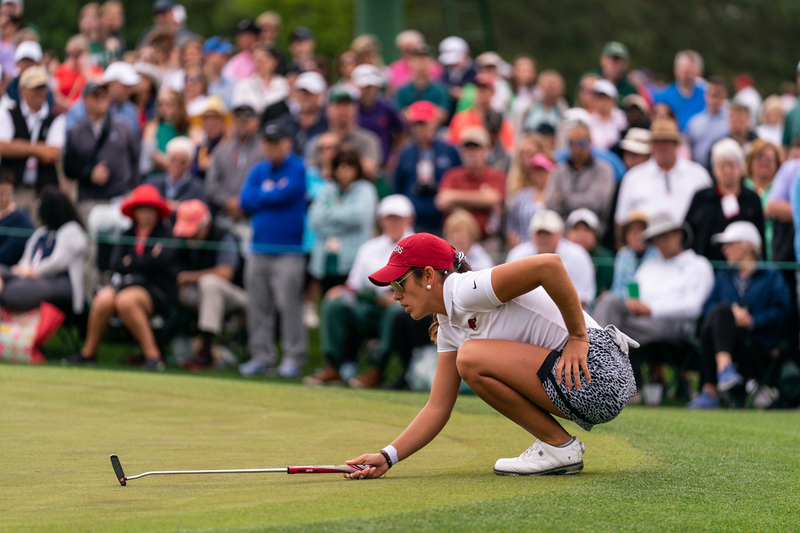 I really wanted to come out here and be an inspiration to other African American girls and women in golf—just try to show them that we can do anything that we set our minds to and that we can open the doors and pave the way for future generations. 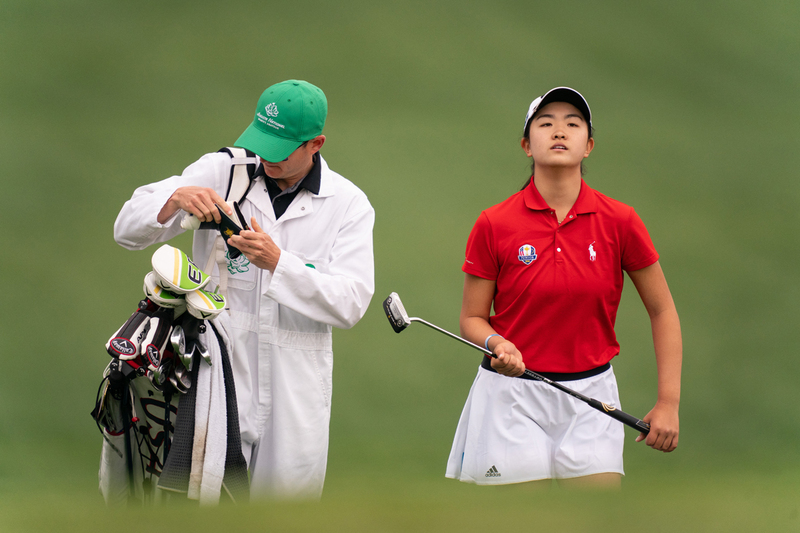 Fifteen-year-old Rose Zhang, of California, looks for her ball as she walks up to the green on the seventh hole. 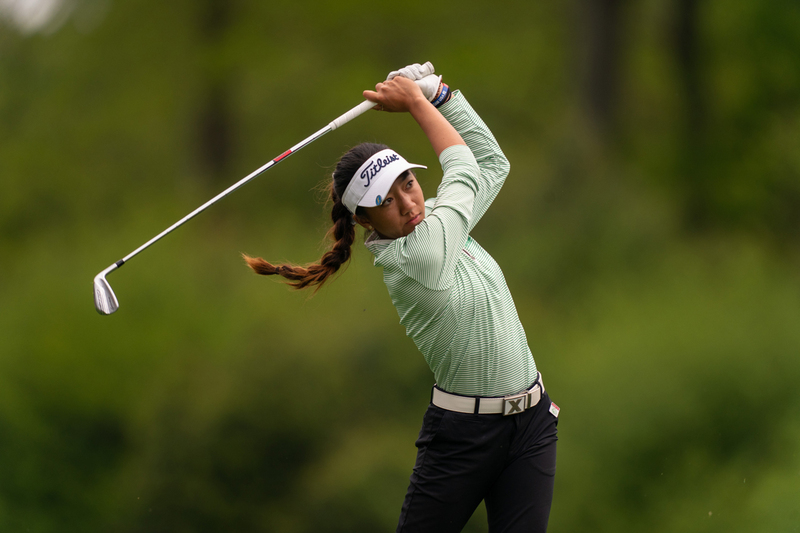 Zoe Campos, a 16-year-old from California, surveys the green on the seventh hole. 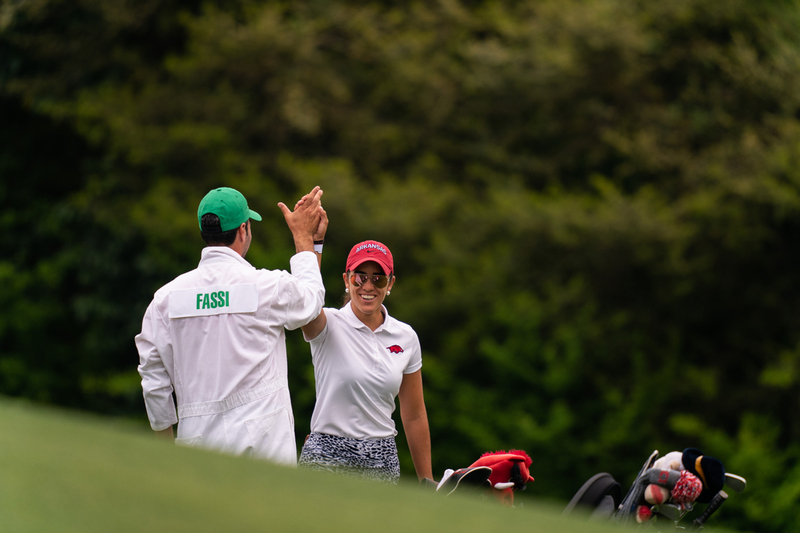 Maria Fassi gets a high five from her caddie after a great approach shot on the 11th hole. 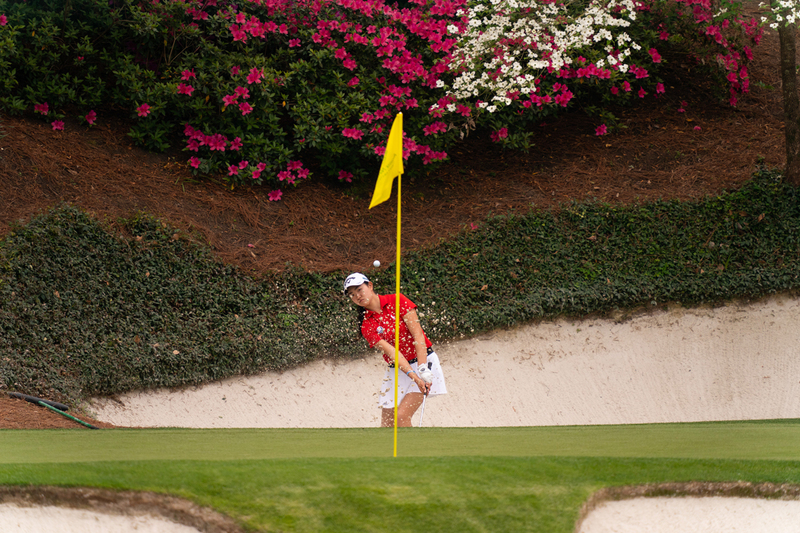 “It was unbelievable playing Augusta. It’s a course I never thought I’d play, especially as a woman. 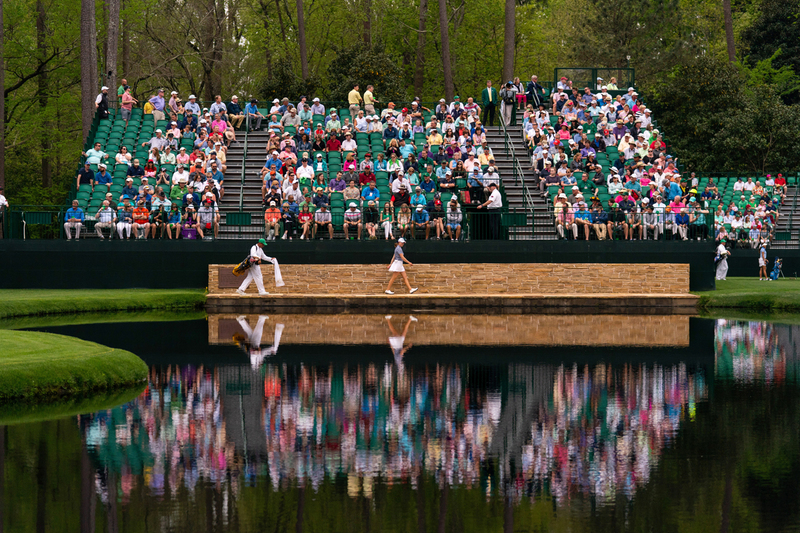 Caterina Don and Haylee Harford walk across the iconic Hogan Bridge on the 12th hole. 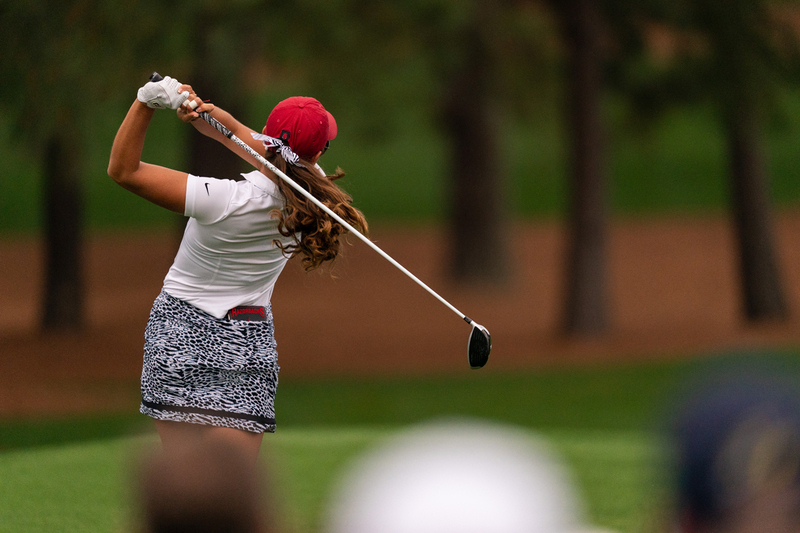 Zoe Campos tees off of the 12th hole. 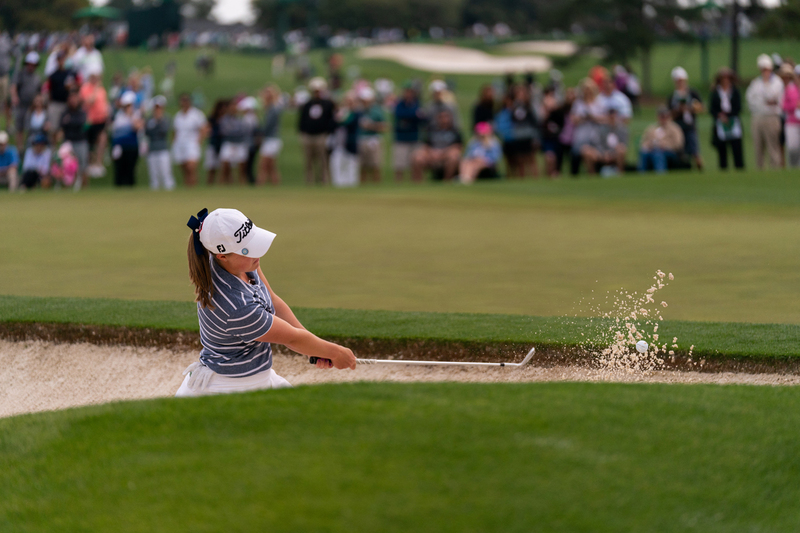 Rose Zhang hits out of the bunker on the 12th hole. 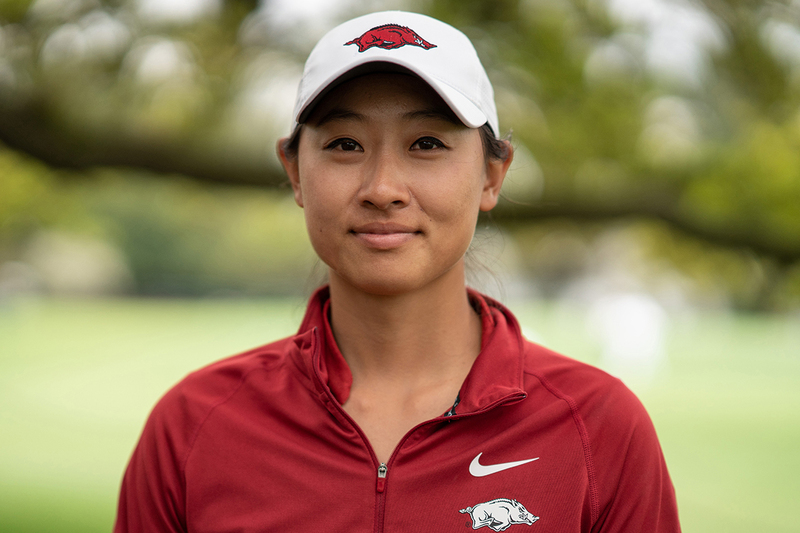 “I really enjoyed all the par threes—there was just a lot of flowers around and the scenery was amazing. Jennifer Kupcho tees off of the 12th hole. 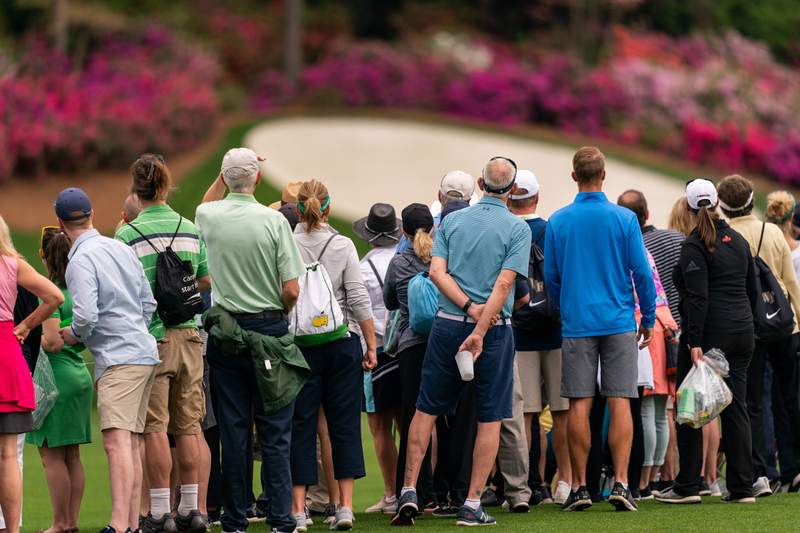 Golf patrons line up on the 13th hole to watch during the final round. 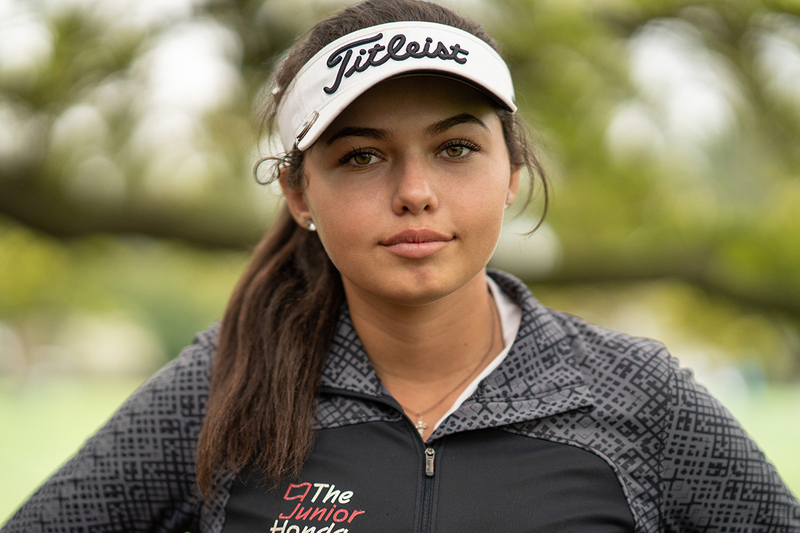 Maria Fassi hits from the fairway of the 13th hole. “It was so breathtaking and such an amazing experience for me. Honestly, I loved the entire course. Every single hole was the best I’ve ever played and so incredibly pure. It’s everything you’d expect it to be and more. 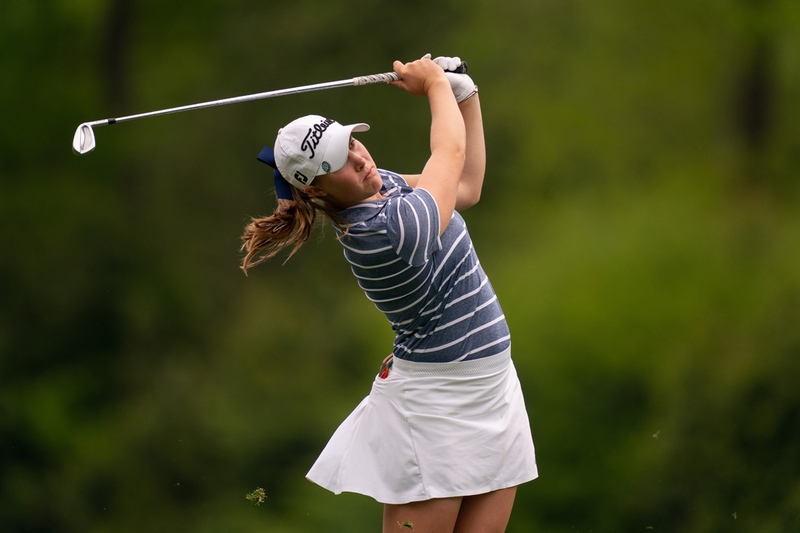 Jennifer Kupcho celebrates as she eagles the 13th hole to tie the lead. 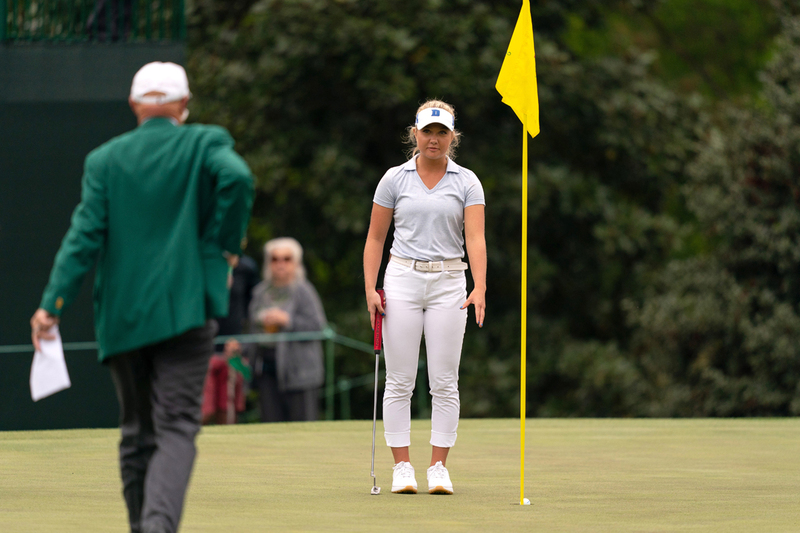 Eighteen-year-old Erica Shepherd, of Indiana, calls over a rules official after her putt on the 14th green. 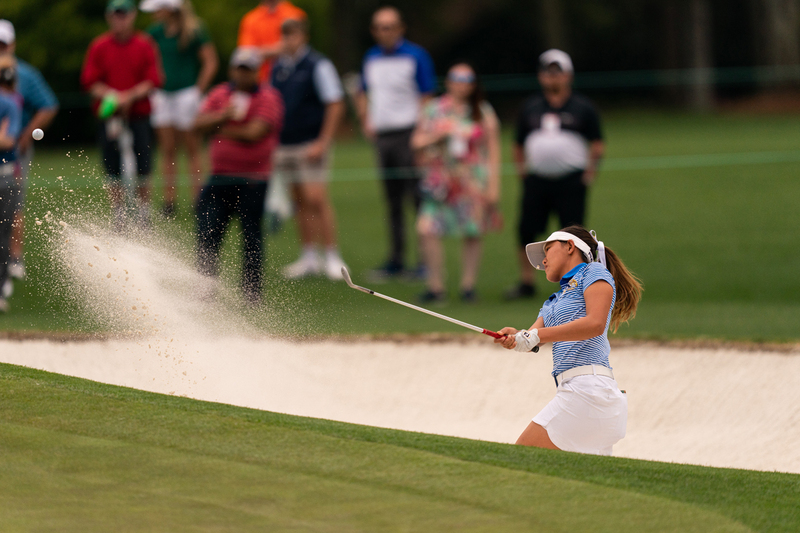 Pimnipa Panthong hits out of the bunker on the 17th hole. 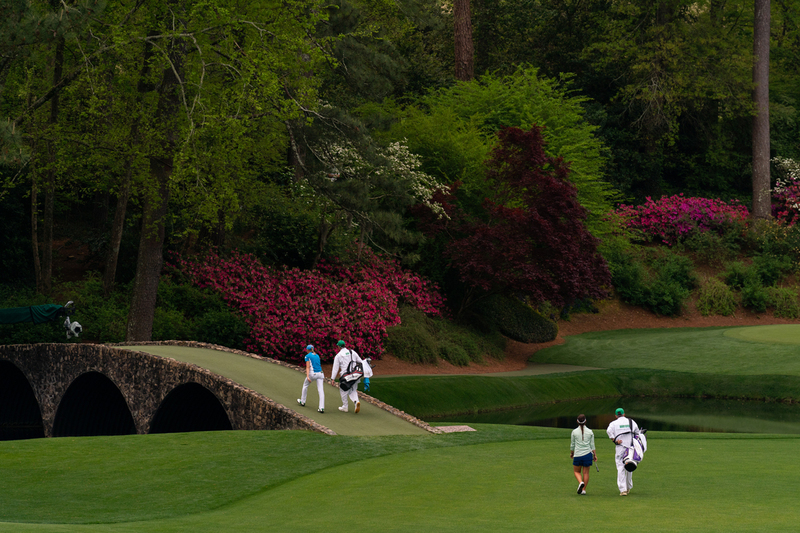 “I was definitely looking forward to Amen Corner. I think all of us here dreamed of being able to walk those three holes. It was definitely a surreal moment, especially with all the magnolias and azaleas in full bloom. 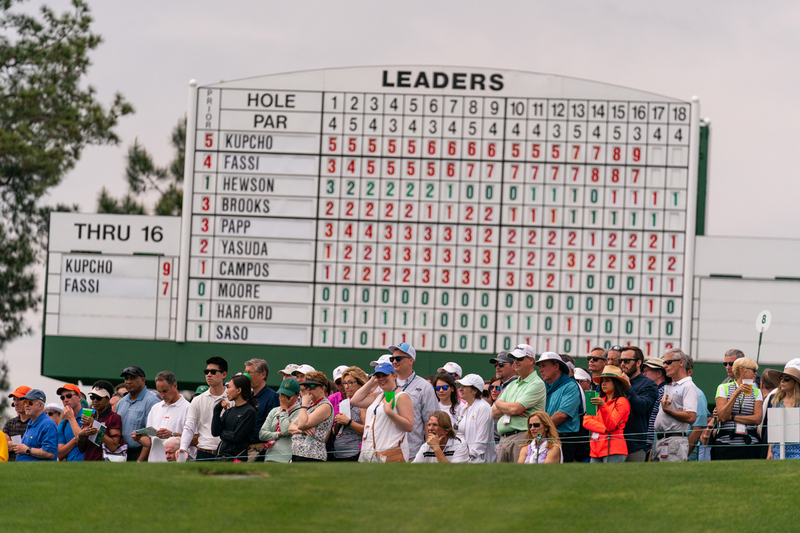 Patrons watch intently on the 17th green during the final round. 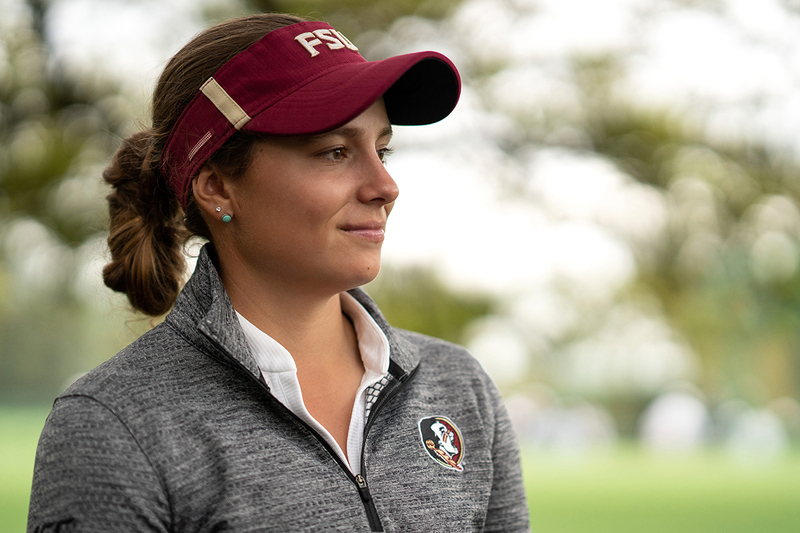 Jennifer Kupcho walks up to the 18th hole with a two stroke lead during the final round. Jennifer Kupcho with a putt for birdie on the 18th hole. “It’s unreal; it’s nothing like what I expected. Number 12—just the bridge—that’s the screen saver on my phone, so just to be there and hit a shot in there, that’s something I didn’t ever think would happen. 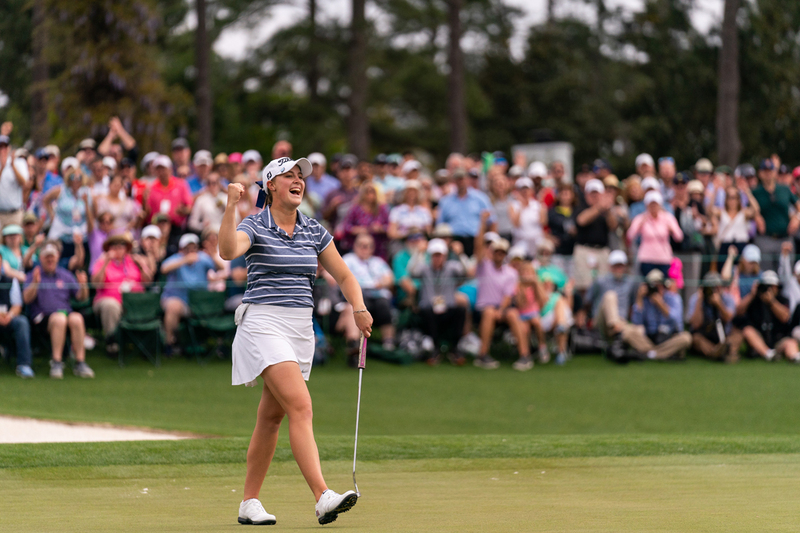 Jennifer Kupcho celebrates after a birdie putt on the 18th hole to win, finishing at -10 under par to become the first champion of the inaugural Augusta National Women’s Amateur. 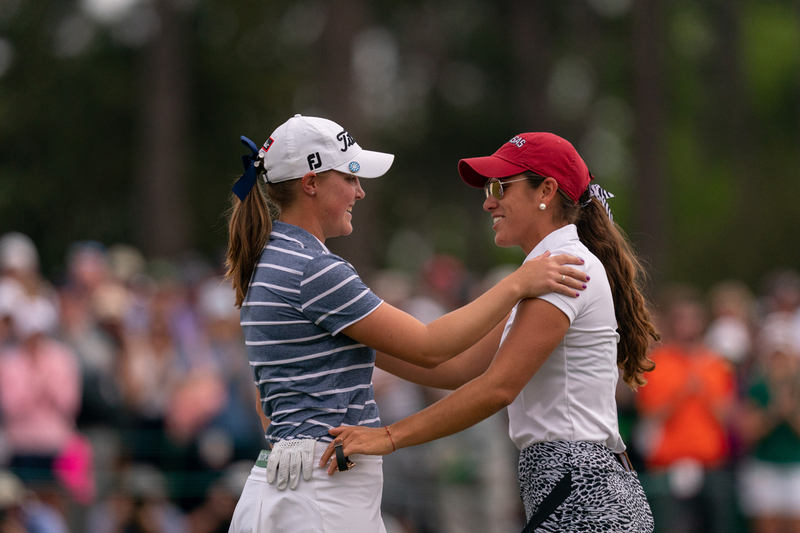 Jennifer Kupcho is congratulated by Maria Fassi after Kupcho wins the inaugural Augusta National Women’s Amateur. Kupcho and Fassi walk off the 18th green. 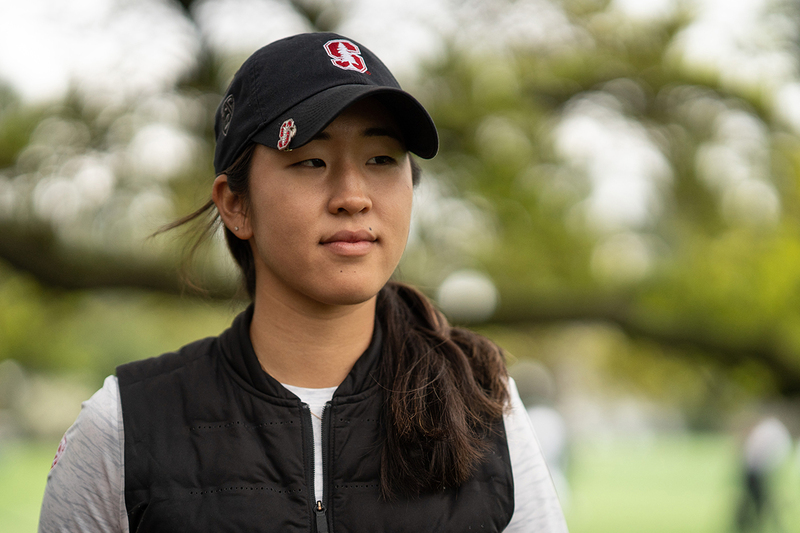 “[This tournament] symbolizes a really big step forward in the women’s game. 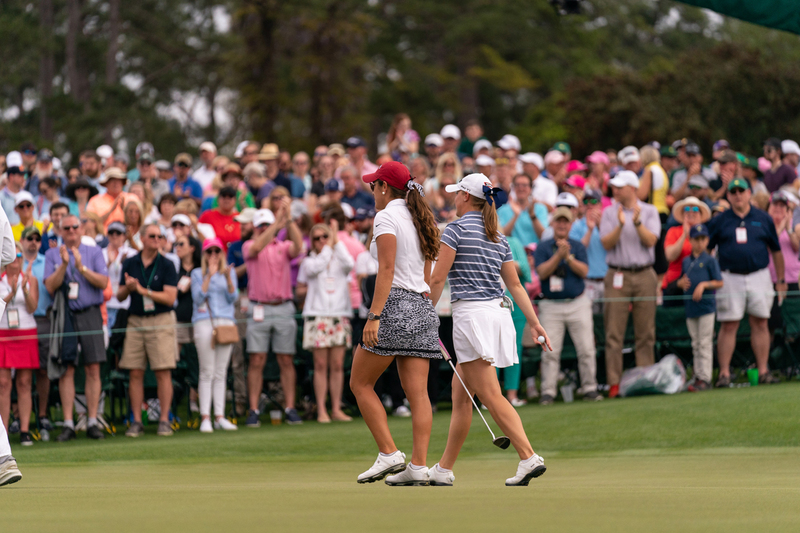 To have Augusta National and the Masters—the pinnacle of golf—recognize women’s golf and invite us to play at this course [sends] a really powerful statement that they are willing to support and give us some credit as female golfers. 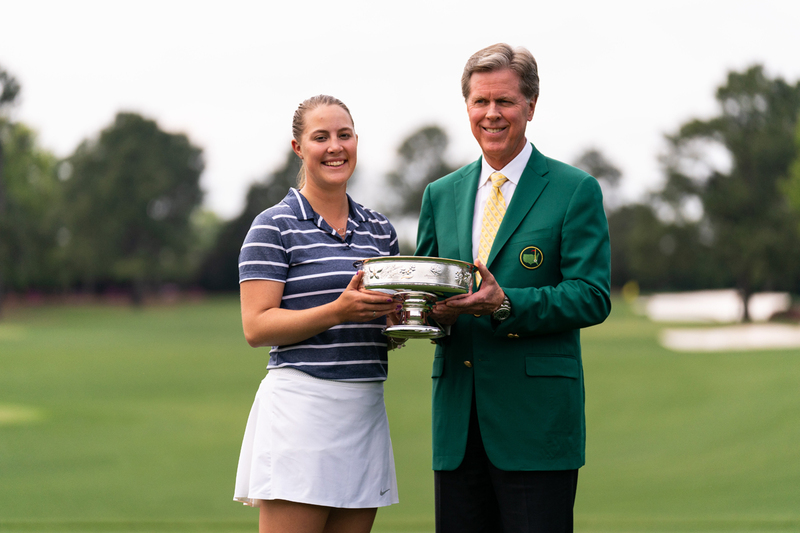 Kupcho poses with Augusta National Chairman Fred Ridely after winning the inaugural event. Kupcho hoists the trophy after her win.